Researchers have discovered more than 130 malware samples designed to exploit the recently disclosed Spectre and Meltdown CPU vulnerabilities. While a majority of the samples appear to be in the testing phase, we could soon start seeing attacks. On January 17, antivirus testing firm AV-TEST reported that it had seen 77 malware samples apparently related to the CPU vulnerabilities, and the number had increased to 119 by January 23. 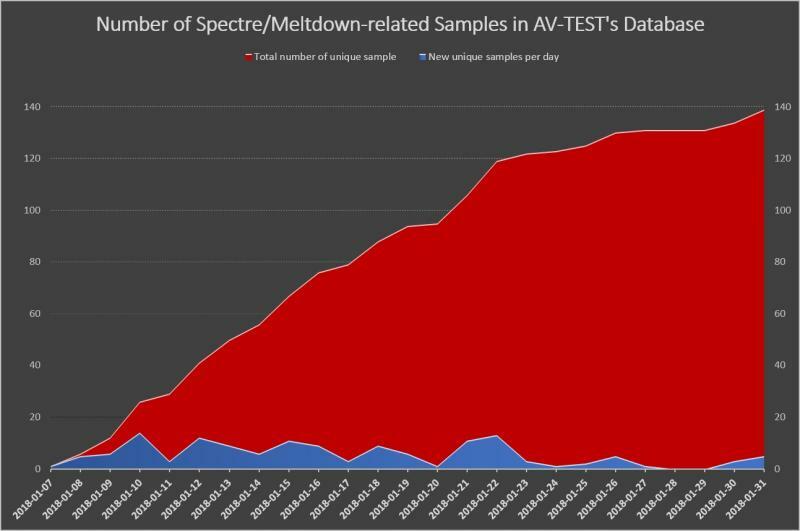 On Wednesday, AV-TEST told SecurityWeek that it has obtained 139 samples from various sources, including researchers, testers and antivirus companies. Fortinet, which also analyzed many of the samples, confirmed that a majority of them were based on available PoC code. Marx believes different groups are working on the PoC exploits to determine if they can be used for some purpose. “Most likely, malicious purposes at some point,” he said. The expert believes the current malware samples are still in the “research phase” and attackers are most likely looking for ways to extract information from computers, particularly from web browsers. He would not be surprised if we started seeing targeted and even widespread attacks in the future. Processor and operating system vendors have been working on microcode and software mitigations for the Meltdown and Spectre attacks, but the patches have often caused problems, leading to companies halting updates and disabling mitigations until instability issues are resolved. In addition to installing operating system and BIOS updates, Marx has two other recommendations that should reduce the chances of a successful attack: switching off the PC when it’s not needed for more than an hour, and closing the web browser during work breaks. “This should decrease your attack surface a lot and also save quite some energy,” Marx said.